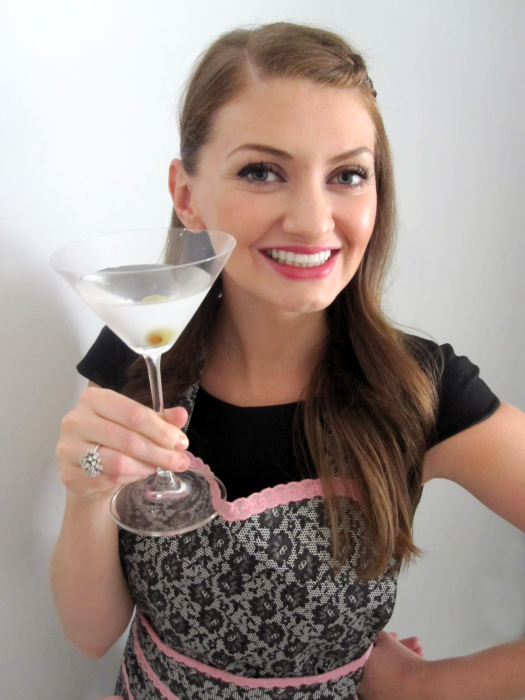 I’m so excited to share this recipe with y’all! It is one of my favorite meals to make for dinner parties/company, as it’s pretty darn simple to prepare with basic, easy-to-find ingredients, deliciously decadent (lots of butter + cream! ), + full of amazing flavor. Plus, it’s easy to double depending on the size of your party, and if you do wind up with leftovers, it makes for a fantastic lunch the following day. While I have made this many times, I’ve never put it on the blog because, when you have people over for dinner, it’s a bit awkward to excuse yourself from the table to get some great pictures of your chicken. =) So, I recently re-made this simply to get some pictures to post it. The fact that it was scrumptious, and my husband, toddler, + I all loved it as much as ever, didn’t hurt, either! For this meal, you take boneless/skinless chicken, pound it fairly thin, then season it, dredge in flour, and get it browned in a good dose of butter. Using the same pan with all that chickeny/buttery goodness, you saute shallots + garlic, add in some cream + wine (or chicken broth, if you prefer), and get everything simmering until you have a lush, creamy sauce. Pop the chicken back in that amazing sauce, let everything simmer for a few minutes while you saute up some spinach, then serve it up! I like to plate mine simply — buttered egg noodles topped with the chicken, the sauteed spinach, a generous ladle of the cream sauce, + a little freshly-grated Parmesan cheese. This meal is pure perfection, and I cannot wait to hear how y’all like it! Place the chicken between two sheets of wax paper, and pound to approximately 1/2″ thick. Sprinkle the chicken with salt and pepper. Dredge the chicken in the flour to coat lightly. Shake off any excess flour. Melt 2 tablespoons of butter in a heavy large skillet over medium heat. Add the chicken and cook until brown, about 5 minutes per side, doing in batches if needed so as not to overcrowd the pan. Transfer the chicken to a plate and tent with foil to keep it warm. Melt 2 more tablespoons of butter in the same skillet over medium heat. Add the shallots and 1 tablespoon garlic and saute until the shallots are translucent, stirring to scrape up any browned bits on the bottom of the skillet, about 1 minute. Add the wine (or chicken broth). Increase the heat to medium-high and boil until the liquid is reduced by half, about 3 minutes. Add the cream and boil until the sauce reduces by half, stirring often, about 3 more minutes. Stir in the parsley. Season the sauce, to taste, with salt and pepper. Add the chicken and any accumulated juices to the sauce, turn the chicken to coat in the sauce, and allow it to continue simmering as you complete the next step. Meanwhile, melt the remaining 2 tablespoons of butter in another large skillet over medium heat. Add the remaining 1/2 tablespoon garlic, + saute 1 minute, until fragrant. Add in the spinach and saute until heated through. Season the spinach, to taste, with salt and pepper. Arrange the spinach over a platter. Place the chicken atop the spinach. Pour the sauce over and serve immediately. Pure perfection is right, girl! You had me at butter! I love anything florentine and the noodles look good too. Just last night I made pork chop florentine for the first time. 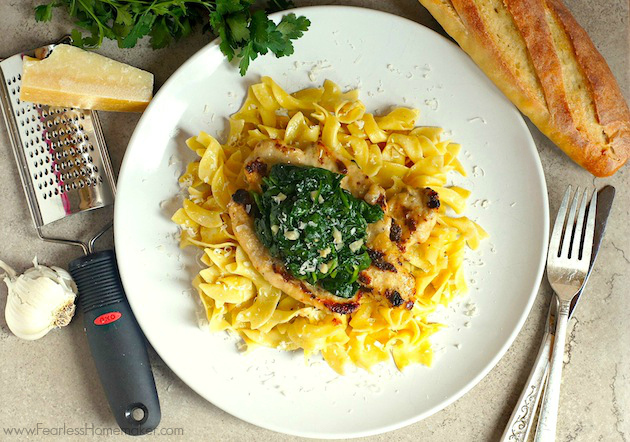 I’ve never made a chicken florentine before.. and am now inspired too – Amy this looks so delicious! I love chicken florentine but have never made it before! So glad you posted this and I can’t wait to add this to our dinner menu. 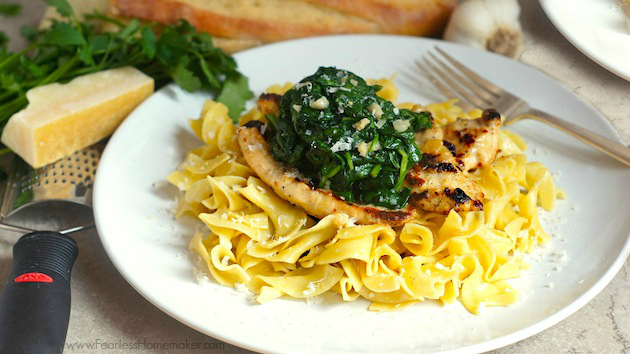 It looks absolutely delicious especially with the buttery noodles and yummy spinach! What a lovely meal! I really enjoy florentine – you just can’t go wrong with spinach with butter + cream! This looks so yummy, Amy!! That pile of spinach looks amazingggg. Love!